Al Williamson deserves every bit of praise that has ever been cast upon him. Hands down one of my biggest, and earliest, influences. Without Al, I highly doubt there would ever be a Johnny Recon. 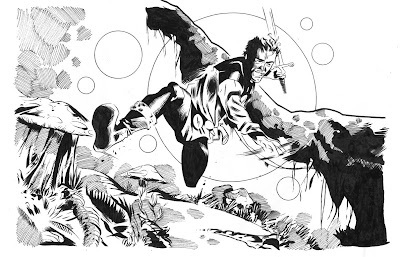 His Flash Gordon work blows me away just as much now as it did when I saw it as a wee lad. The man may have passed on but his legacy and his artistic footprint will live on forever. You'll be missed, Mr. Williamson, but never forgotten. I love the line work in the landscape and the multiple moons. Great composition and nice action. Its a fitting tribute. Love this one, Mitch! It's a great combination of Flash Gordon and Al himself. Very nice. Love it all. The circles, the action, the sword, the facial expression, the motion, the perspective. Very nice.